EUR/USD: Wave (c) of 2 ended at 1.3993 and wave 3 of III has commenced for weakness to 1.0411 (1.236 of wave 1), then 1.0000. Although the single traded lower again last week, the subsequent bounce from Friday’s low of 1.1669 suggests consolidation above this level would be seen and test of 1.1788 cannot be ruled out, however, break there is needed to suggest low is possibly formed, bring further gain to 1.1833 but only break there would signal the fall from 1.2093 top has ended, bring a stronger rebound to 1.1865-70 and then 1.1900-10, however, still reckon upside would be limited to 1.2005 and bring further consolidation. Only break of resistance at 1.2034 would signal the pullback from 1.2093 has ended and recent upmove from 1.0340 low has resumed for retest of 1.2093, then towards 1.2150-55 (61.8% projection of 1.1119-1.1910 measuring from 1.1662), having said that, loss of upward momentum should prevent sharp move beyond 1.2200-10 and price should falter below 1.2255-60, risk from there remains for a much-needed correction to take place later. Our preferred count on the daily chart remains that a wave (II) from 1.2329 ended at 1.5145 with A-leg ended at 1.4720, followed by wave B at 1.2457, the wave C from there was also a 3 legged move and is labeled as (a): 1.3739, (b): 1.2885, the wave iii of the 5-waver (c) from 1.2885 has ended at 1.4339 and wave iv is a triangle ended at 1.3878 and wave v formed a top at 1.5145. 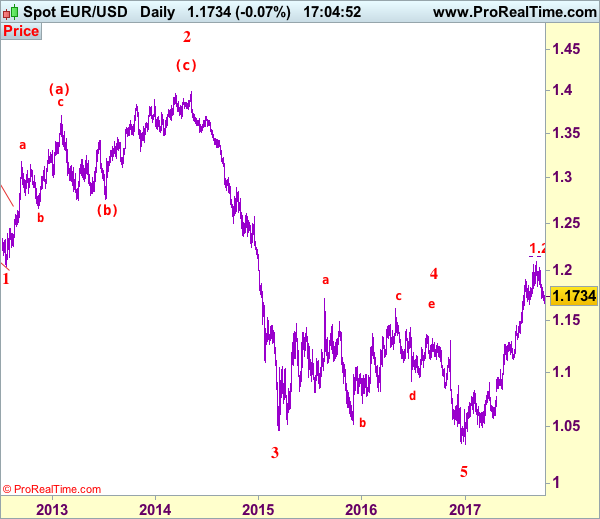 The decline from there is a 5-waver (C) with minor wave (i) of I of (C) ended at 1.4218 with wave (ii) ended at 1.4580, wave (iii) ended at 1.3267 and wave (iv) ended at 1.3692 and wave (v) ended at 1.1876, this is also the low of wave I of (C) and wave II ended at 1.4940, hence wave III is now in progress with a diagonal wave 1 ended at 1.2042, the breach of previous support at 1.1876 (wave I trough) adds credence to our view that the wave 2 has ended at 1.3993, wave 3 has commenced for further weakness to 1.0411, then towards 1.0000. On the downside, below said support at 1.1669 would signal the corrective fall from 1.2093 top is still in progress for retracement of recent rise to previous support at 1.1662 (previous 4th of a lesser degree), break there would extend weakness to 1.1600-10 and possibly 1.1550-60 but reckon downside would be limited to 1.1500 and support at 1.1479 should remain intact, bring rebound later. Recommendation: Stand aside for this week. 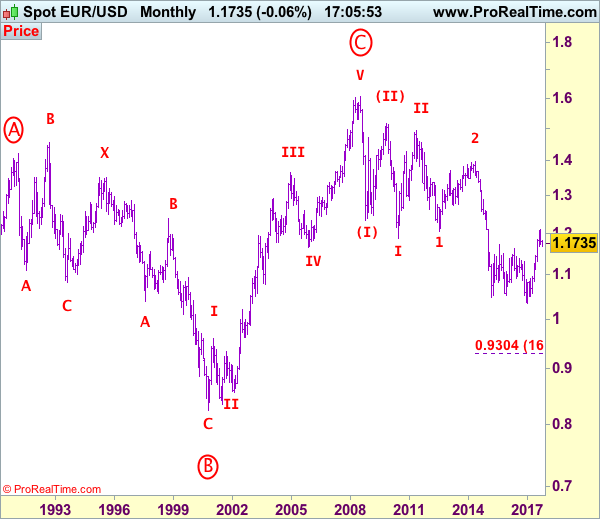 Euro’s long-term uptrend started from 0.8228 (26 Oct 2000) with an impulsive structure. The rise from 0.8228 to 0.9593 (5 Jan 2001) is labeled as wave I, the retreat to 0.8352 (6 Jul 2001) is wave II and the rally to 1.3670 (31 Dec 2004) is wave III. Wave IV from there ended at 1.1640 (15 Nov 2005), the subsequent upmove to 1.6040 (July 15, 2008) is treated as wave V, the major selloff from the record high of 1.6040 to 1.2329 (October 27, 2008) signals a reversal has taken place with (I) leg ended at 1.2329 and once (II) ended at 1.5145, wave (III) itself is an extended move with I: 1.1876 and complex wave II ended at 1.4902, wave III has commenced with wave 1 and 2 ended at 1.2042 and 1.3993 respectively, wave 3 of III is now unfolding for weakness towards parity.